This striking image, taken with the FORS2 instrument on the Very Large Telescope, shows a beautiful yet peculiar pair of galaxies, NGC 4438 and NGC 4435, nicknamed The Eyes. The larger of these, at the top of the picture, NGC 4438, is thought to have once been a spiral galaxy that was strongly deformed by collisions in the relatively recent past. The two galaxies belong to the Virgo Cluster and are about 50 million light-years away. This striking space wallpaper, taken with the FORS2 instrument on the Very Large Telescope, shows a beautiful yet peculiar pair of galaxies, NGC 4438 and NGC 4435, nicknamed The Eyes. 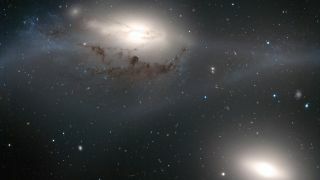 The larger of these, at the top of the picture, NGC 4438, is thought to have once been a spiral galaxy that was strongly deformed by collisions in the relatively recent past. The two galaxies belong to the Virgo Cluster and are about 50 million light-years away.